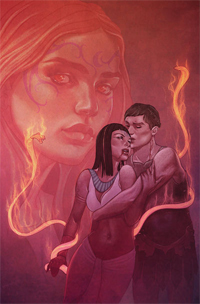 This month we get to see Zoey Redbird complete her initiation into the five elements in House Of Night #5. Her lesson for the last element, spirit, is one that holds a lot of meaning for her. Not everyone is able to survive the change from human to vampyre, and it takes four years of training to do so. We learn that the stress on their bodies and minds can take a toll. 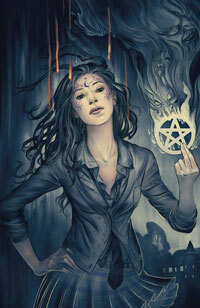 Zoey spends this issue coming to terms with a choice she made prior to her training at the House of Night. Having imprinted on someone from her past, it seems only fitting that the story of Hippolyte and Herakles contained the same problem. Learning from the mistakes of vampyres past has aided Zoey several times and this is no exception. We return to the story of Zoey Redbird, a fledgling vampyre attending the Tulsa House of Night and learning to control her newfound powers. 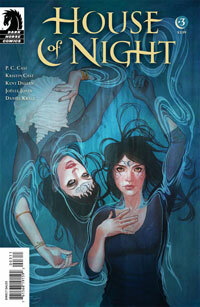 House Of Night #4 addresses the issues of overconfidence and vanity. When Zoey accidentally destroys something sacred to her goddess, she decides to concentrate on repairing the damage done and learning from the experience. Whereas most teenagers are obsessed with dating, school, and parties, Zoey Redbird has other things that occupy her life. Of course, since she is a magic-wielding vampire that pretty much explains it all. in House of Night #3 we get a bit more background regarding both who Zoey is and who she was before being marked by the goddess Nyx. For the record, the events in this series take place between scenes in the second novel, Betrayed, from the House of Night book series. Imagine my surprise when I started reading this comic, one that I chose on a whim, and found it’s based on a young adult book series that I used to sell tons of during the last few years my bookstore was open. Now imagine my further surprise when I realized that I liked it! 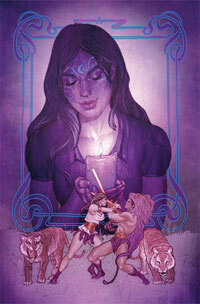 It’s got its quirks, but House of Night #1 is a pretty fun read. Now, I went into this knowing exactly zilch about the books, so no preconceived notions about the characters or setting. Add to that the fact that there is absolutely no back story or prologue and you have a blank slate on which to create this series. P.C. Cast and Kristin Cast were familiar to me, but Kent Dalian is someone I didn’t know.